Yucca Plantation, now known as Melrose, is a 200-year old cotton and pecan plantation located on the banks of Cane River Lake. The plantation has nine standing historic buildings, three of which bear explanation here. The oldest of these is Yucca House, built between 1796 and 1814. This French Creole cottage served as the first big house for the plantation. 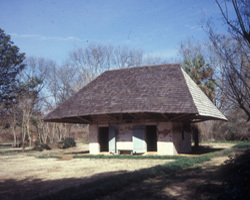 The second building is the African House, constructed sometime between 1800 and 1830. Many have speculated that it was built to resemble traditional African homes, although others claim its inspiration comes from French barns. Finally there is the current big house, which was completed in 1833. This bousillage (a mixture of mud, Spanish moss and deer hair) building has been remodeled numerous times and has several additions, including two distinctive hexagonal towers, known as garçoniéres, flanking the front gallery. Louis Metoyer originally acquired the land in 1795. Metoyer was the second son of Jean Baptiste Metoyer, a French planter, and Marie Thérèse Coincoin an African slave owned by Metoyer and later freed by him. He and his descendents built and managed a plantation here until 1847, when it was sold to the Hertzogs, the family that owned Magnolia Plantation. Joseph Henry later acquired the land and moved his family onto it in 1898. He died the next year and the property was passed on to his son, John Hampton Henry, and his daughter-in-law, Cammie Garrett Henry. Miss Cammie, as she was known, was a college-educated woman who was fond of culture and society. She started an art colony at the plantation that became one of the most popular in the South, entertaining such famous names as William Faulkner, Lyle Saxon and William Spratling. During the Henry era, famed “self-taught" artist Clementine Hunter also got her start at Melrose, where she worked as a cook and painted in her spare time. She became the first African American to have a solo exhibit at the New Orleans Museum of Art. 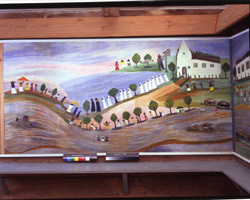 Her work depicts daily life in the rural South prior to the mechanization of agriculture. In 1971, the plantation was donated to the Association for the Preservation of Historic Natchitoches (APHN). The organization has conducted numerous repairs and restorations through the years. 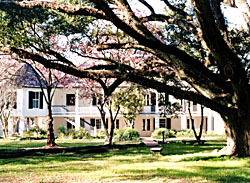 APHN still maintains the plantation and gives tours of the grounds daily. Yucca (Melrose) Plantation, a National Historic Landmark, is located several miles south of Natchitoches at the junction of Hwys. 119 and 493 in the village of Melrose. It is open for tours from 12:00pm and 4:00pm Tuesday to Sunday, closed major holidays; there is a fee for admission. For further information call 318-379-0055 or visit the Association for the Preservation of Historic Natchitoches’s website Melrose Plantation has also been documented by the Historic American Buildings Survey.